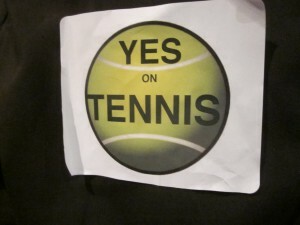 Tuesday night the Anchorage Assembly finally decided the issue of a state-funded recreation center with tennis courts. Assembly members approved $4.4 million for the project. The Alaska Tennis Association had originally requested $7.2 million to build the recreation center which would include a public tennis facility in West Anchorage near the existing ice arena. Supporters of building the Northern Lights Recreation Center which would house six indoor tennis courts wore stickers with the words ‘Yes on Tennis’ scrawled across a green tennis ball at the regular meeting of the Anchorage Assembly Tuesday night. The Tennis Association did its own lobbying for the money and says $4.4 million won’t be enough. Allen Clendaniel, President of the Tennis Association says supporters have mixed feelings. The Assembly has been debating whether it could or should use a state capital line item to fund the controversial project since early October. Assembly members did not request money for it and some legislators said they did not know they had approved it. The money for the rec center was buried in a package meant for infrastructure maintenance. During the meeting, Assembly member Amy Demboski tried to put the issue before voters as bond measure but that was voted down. Mayor Dan Sullivan came to the meeting with some legal opinions that he said contradicted a Legislative Affairs opinion that a new facility was not within the legislative intent of the capital budget item for maintaining existing facilities. Clendaniel says supporters hope a 2014 legislative request will provide the additional funds needed to complete the project. Mayor Sullivan has seven days to veto the item.